Living at home has a million reasons to stay but occasionally my mother's opinions on my outfit give me a reason to want to leave. "That skirt is so short I can't even look," she said to me this morning as I sashayed into the kitchen. I saw a very similar outfit on one of my favorite blogs Helmi otsalla recently and was waiting for a good day to try it out. The skirt is most certainly a mini skirt, but I'm literally buttoned up everywhere else. Living with my mom has subtly influenced my style in that way, because I could never wear anything but long sleeves with a mini-skirt (to work at least). Before I even leave my room I can usually guess exactly what she will deem appropriate. Thanks mom for my some of my own strictly self imposed style rules. If you wear a low cut shirt don't wear a short skirt, shoulders should be covered at work unless the air conditioning breaks, and always carry a sweater. My favorite is the fingertip test; if the skirt is shorter than where your fingertips fall you can't wear it in public. I'm not sure if she's actually said any of these out loud, except the fingertip one, but they have been imprinted upon my brain and there they will stay. Back to my original point, I sashayed into my kitchen and after she couldn't look at my skirt I dropped my arms and measured the length of my skirt which was just the right length. I felt kind of awesome today. Psh, that skirt is adorable. I think your mom only thought it looked short because since it starts at your waist rather than your hips, your legs look longer and thus your mom simply thought it was because your skirt was too short. I think the skirt is perfect! I feel like opaque tights make the shortest of hemlines that much more appropriate, but that may just be me trying to justify those short lengths since I had similar comments from parentals. Your outfits are always so cute! Very sweet! 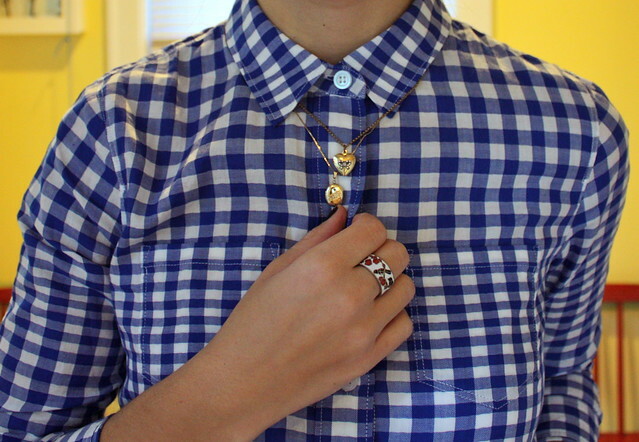 I love a shirt buttoned to the neck. And that skirt is a really nice shape! I don't think the skirt is too short. Especially because you are wearing tights underneath. I really love the blouse! Very pretty outfit. And interesting commentary on your interactions with your mother. You look completely tasteful! Especially with the black tights. This is a very inspiring look. Well...it's not that short :-) You look great, there's no reason to wear something off-the-regular from time to time! THIS IS SO CUTE! Wow, I didn't realize how lucky I am to have a non-strict mom. I'm pretty sure every mom knows the finger tip test, though. You look really great! I love blouses buttoned all the way up to the top and it goes very well with the skirt! The boots are divine, too. I think that skirt is awesome! I really want one like it. The shape is great and so is the color. The gingham top is super cute with it. AW i hated that about living at home too! the skirt is fine, i wouldnt even consider it that short ;) i love this outfit so much! Stunning! The whole outfit is simply perfect. I read the title of this post too fast and I was like "Mint Julep ??!" While I do (greatly) appreciate the wonder that is la mini jupe, I think you should do a mint julep en mini jupe post. haha we had that finger rule test at my high school.. bad for the taller/longer-armed girls. I'd say this skirt is def a good length though regardless, and you have tights on, which kind of validates even the shortest skirt/dress in my book. Either way you look just darling with the plaid & corduroy! my mom still does that whenever i come to visit her. when i'm walking up the stairs and i'm wearing a short skirt, she's fond of saying "WOAH channie, i can see your whole address!!" i love that skirt on you though, and i don't think it's immodest at all. especially with the tights!! same at my high school!! Yea, only if you come drink mint juleps with me. How is Paris in March? you look so cute! I know want that skirt. xo lincoln! your necklaces are really sweet. I like them.